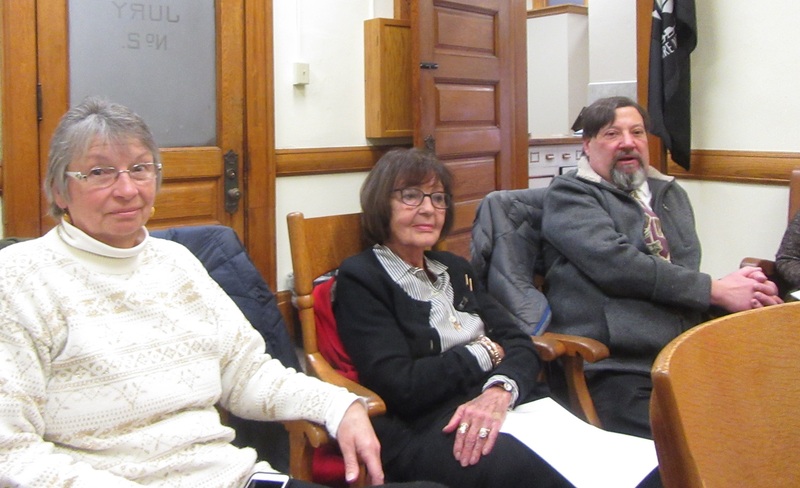 Bradford County Library bookmobile clerk Rosemary Wynot (above, center), board of trustees vice president Lynda Warner (center) and director Jeffrey Singer participate in a discussion at the Bradford County Commissioners meeting on Jan. 10 about the construction of a brand new bookmobile. At their Jan. 10 public meeting, the Bradford County Commissioners agreed to order a new vehicle that will serve the county library system as a new bookmobile. The cost of $257,897 was made obtainable by a “large donation” from a donor who the commissioners opted to keep anonymous at this time. The county and the library system will cover the remainder of the costs. Keeping the old Blue Bird bus that had served the library system for many years on the road was proving too costly, and bookmobile services were discontinued for awhile then reinstated with a former Endless Mountains Transportation Authority bus. According to Bradford County Library Board vice president Lynda Warner, a committee was formed last year to initiate a promotional campaign, which caught the attention of the secret donor and others. “We had wonderful response,” Warner stated. “We owe a lot to the committee and Rosemary,” in reference to bookmobile clerk Rosemary Wynot. The significant donation will allow for a larger vehicle that, 22,000 lbs, is light enough to not require drivers to have a CDL license. Nonetheless, the 27-foot bus will be stocked with technical advances such as WiFi and a Smart screen on which movies and programs for children can be projected. A new promotion will be announced to solicit ideas for adorning the outside of the new bookmobile with images and icons that reflect the county. It is hoped that the new vehicle, which is being built from the ground up, will make its first public appearance by the fall. Warner noted that Bradford County has one of the oldest bookmobile programs in the country, having started in 1941. 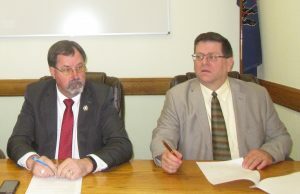 Subsequent to the appointment of Duane Haight to the board of the Bradford County Airport Authority, the commissioners embarked on a lengthy conversation to reaffirm their views of why the flight school there was closed down in 2018, as well as a changes they anticipate that will make the facilities more accessible to the general public. Haight will replace Craig Chaffee, whose term expired on Dec. 31, 2018. “He has a great love for aviation and a lot of knowledge to bring to the airport,” McLinko said of Haight, who started fly school and learned to fly at the airport in Towanda Township. Commissioner Ed Bustin added that Haight is retired from the US Air Force. The airport became a source of controversy last year after the appointment of Kerry Spaulding as airport director and the subsequent closure of the flight school. Spaulding reviewed the county’s liability insurance policy for the facility and expressed concerns that it might not fully cover all of the activities conducted there. As it turned out, he was correct. Had someone learning to fly had an accident, McLink explained at a previous meeting, the county would have been on the hook for what could have been catastrophic damages. Further analysis made county officials and airport board members wonder if social events like weddings and “hangar party” fundraisers that involved the presence of alcohol, might also not be covered. “We want the airport to be something that the county can be proud of and watch it grow,” commissioner Daryl Miller (above, left) added. McLinko suggested that he would like to see fly-in breakfast events return, as well as birthday parties and Scout visits to get youths interested in aviation. In the meantime, he related, there are at least two bids for takeovers of the flight school by private interests that the board was slated to review on Jan. 16. CDBG Housing Rehab grants coordinator Amanda Boyer was on hand as the commissioners approved a $50,000 contract to study the homeless situation in the county. The Emergency Solutions Grant is a first for Bradford County and will be used to establish a database for homeless persons, available shelters, local needs and services and more. Bustin noted that such information is required by the state, but the county never had the funds to complete the studies. On Jan. 23, a Local Housing Opportunities Task Force (LHOP) will canvass various points in the county at the direction of other agencies, and non-profit and faith-based groups that already provide services for homeless individuals. They will conduct a “physical verification” of the county’s homeless status. Pennsylvania attorney general Josh Shapiro has asked the county commissioners to organize a town hall meeting to discuss gas royalty issues. The event will be held at Towanda High School on Thursday, Jan. 23, from 4:45 to 5:45. Shuttles will be provided from parking lots at the base of the hill to make the event more accessible. “We know this continues to be an ongoing issue,” Bustin remarked.